So, before we get started, let me ask you a VERY important question....Team Edward or Team Jacob?? Personally, I am all about Team Emmett...Kellan Lutz...please...eye candy if ever I saw some! 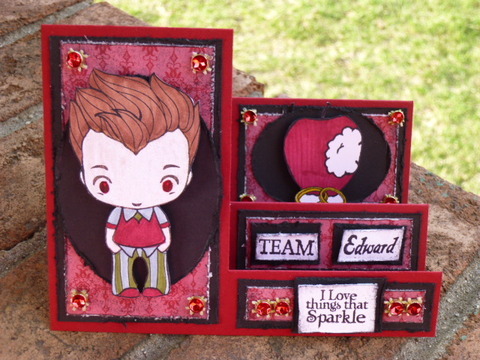 This week's Drunken Stampers challenge is inspired by the Twilight movies. For this challenge you can either use the Twilight movies OR "creatures of the night" as your inspiration. Be sure to visit the DRUNKEN STAMPERS BLOG for all the details on this week's challenge. I have a few different Twilight themed stamp sets. For this challenge I decided to make an Edward themed side step card. You probably can't tell in the picture, but I painted his face and arms with champagne glimmer paint (SU) to make Edward sparkle. Great card... Is there a Jacob stamp too? Christa would love it. Awesome card Donna, i love the sidestep card it's perfect. Nicely coloured too. AMAZING! Your card just blows me away Donna! Love that you even made Edward's skin sparkle! Well of COURSE you had to make him sparkly :) LOVE the sidestep card!! Wow. Great job. Very clever. I have to admit, I am too old to be on either team.